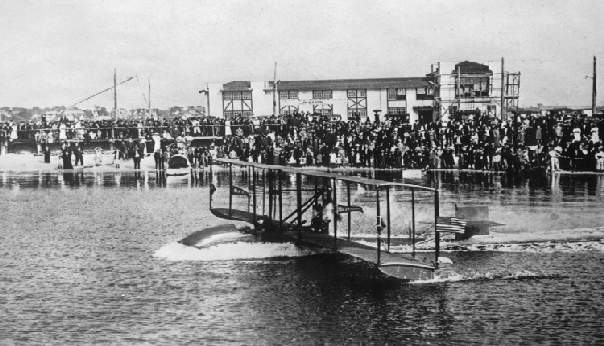 1 January 1914: The world’s first scheduled commercial passenger flight took place when Antony Habersack Jannus piloted a St. Petersburg–Tampa Airboat Line Benoist Type XIV flying boat from St. Petersburg to Tampa, Florida. The passenger was St. Petersburg’s mayor, Abraham C. Pheil. Over 3,000 people witnessed the departure. The federal government determined that pilots of commercial flights should be licensed. 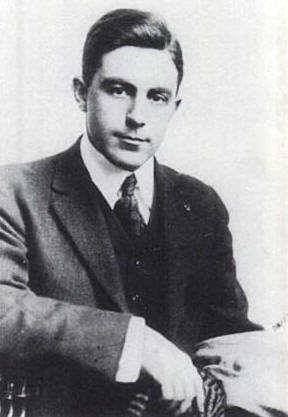 Jannus became the first federally-licensed pilot. 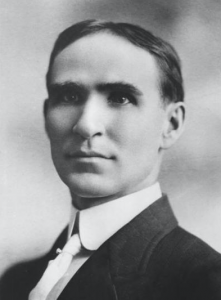 SPT Airboat Lines was started by a local St. Petersburg businessman, Percival E. Fansler. 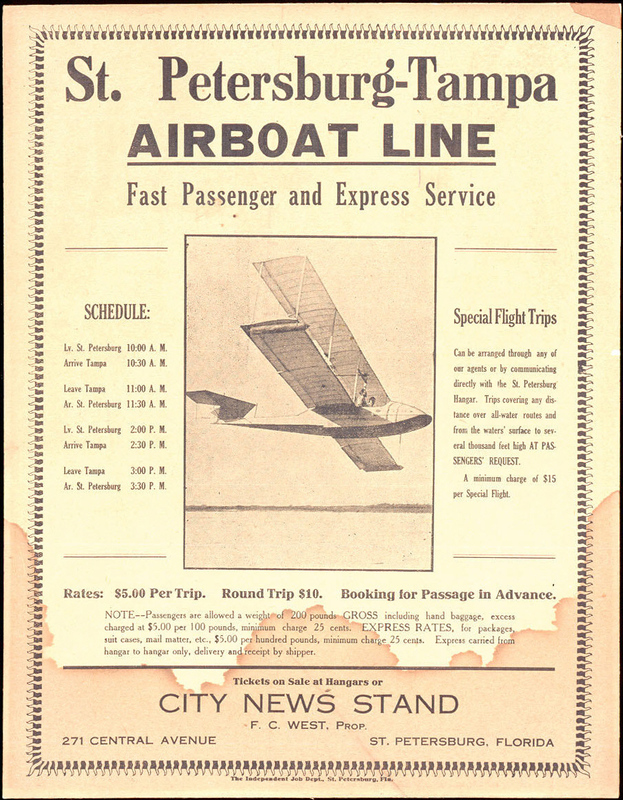 Arrangements were made for the City of St. Petersburg to provide a $2,400 subsidy, payable at $40 per day, if SPT maintained a schedule of two flights per day, six days per week, for three months. Passenger tickets were priced at $5.00. The Benoist Type XIV was a biplane designed by Thomas W. Benoist. The airplane was 26 feet (7.925 meters) long. The upper and lower wings both had a span of 44 feet (13.411 meters). Empty, the Type XIV weighed 1,250 pounds (567 kilograms). Jannus’s Benoist was powered by a water-cooled, normally-aspirated, 477.129-cubic-inch-displacement (7.819 liter) Roberts Motor Company 1913 Model 6-X two-cycle inline six-cylinder engine which produced 66 horsepower at 1,000 r.p.m., and 75 horsepower at 1,225 r.p.m. It was a direct-drive engine which turned a 10-foot (3.048 meter) diameter two-bladed wooden propeller in a pusher configuration. The engine was 4 feet, 4.5 inches (1.334 meters) long, 2 feet, 1 inch (0.635 meters) high and 2 feet, 0 inch (0.610 meters) wide. It weighed 275 pounds (125 kilograms). The airplane had a maximum speed of 64 miles per hour (103 kilometers per hour) and a range of 125 miles (201 kilometers). 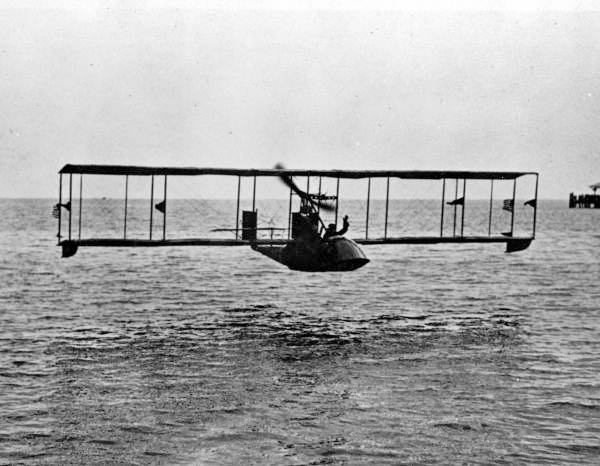 There were two Benoist Type XIVs, both purchased by the St. Petersburg Tampa Airboat Lines. They were named Lark of Duluth and Florida. Over the next three months, the two flying boats carried 1,205 passengers and flew over 11,000 miles (17,702 kilometers). When the city subsidy ceased, the airline was no longer profitable and the operation came to an end. Lark of Duluth was used to fly passengers at several cities around the United States, but was damaged beyond repair at San Diego, California. Designer Thomas W. Benoist was killed in a trolley accident at Sandusky, Ohio, 14 June 1917. 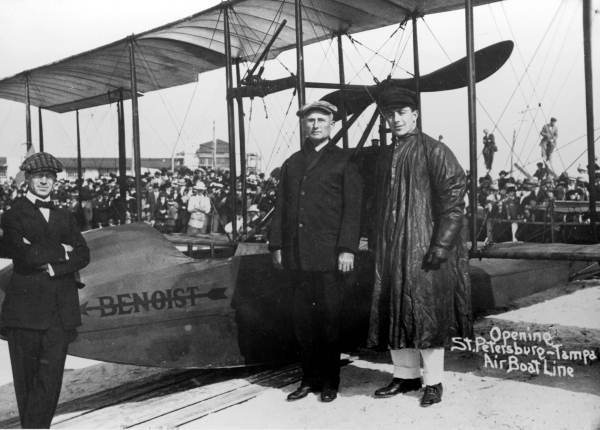 Tony Jannus became a test pilot for Glenn Curtiss. In 1916 he was demonstrating a new Curtiss Model H flying boat in Russia, as well as training pilots. The airplane crashed into the Black Sea near Sevastopol. Jannus and two passengers were killed.